Effective on 22 February 2018, it is mandatory for organisations complying with the Act to report significant data breaches to the Office of the Australian Information Commissioner (OAIC) and the affected individuals. This is not a new concept as it currently operates voluntarily under the Act. Previously, reporting data breaches was only voluntary. The new NDB scheme introduces compulsory disclosure for organisations with annual turnover of $3M and above and entities who meet the various “test categories” listed below. A Notifiable Data Breach could occur when a customer's or employee's personal information on a device (e.g. USB key) is lost or stolen, a database is hacked or personal information is mistakenly provided to the wrong person or made public. Personal information (including sensitive information) is information or an opinion that identifies or could reasonably identify an individual. Generally this includes: name, address, telephone number, signatures, date of birth, medical records, bank account details, etc. It also includes opinions about someone including comment on a person’s career, performance, attitudes and aptitude. Sensitive information is a subset of personal information and is generally afforded a higher level of privacy protection under the scheme. This includes racial or ethnicity origins, political, sexual orientation, philosophical beliefs, health information, criminal records etc. To avoid creating “data breach fatigue”, the OAIC only requires data breaches “that are likely to cause serious harm to individuals” to be reported. Serious harm means the breach is more probable than not likely to cause psychological, emotional, physical, and reputational harm to individuals. What parties have gained unauthorised access to the personal information. 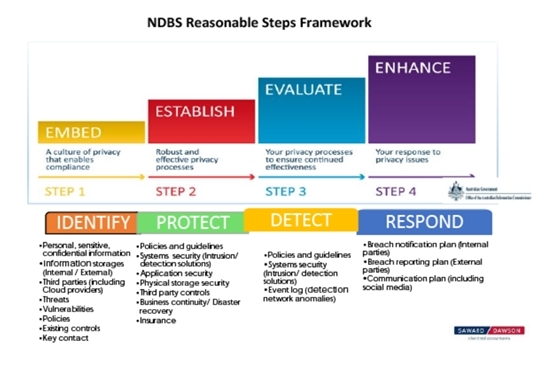 The NDB scheme applies to both the private and public (commonwealth agencies only) sectors. It can apply to individuals (including a sole trader), body corporates, partnerships, unincorporated associations and trusts. Entities could also be prescribed by the Privacy Regulation 2013, or bound by the scheme by other regulations. If none of the above applies, the scheme will apply to entities that choose to participate in the scheme as best practice. The aim of the scheme is to ensure that ongoing reasonable steps are performed to protect personal information (including sensitive information) from misuse, interference and loss, as well as unauthorised access, modification or disclosure. This is an objective test and your organisation must be able to justify to the Commissioner (from a reasonable person’s perspective) that the following steps have been considered and/or performed. Identify personal information that is not required to be held and then perform “de-identification” of that personal information so that those individuals may no longer be identified. 5. Start engaging with external reporting channels (OAIC, security contractors etc.) That way if a breach occurs you will have a known access point. 8. Maintain ongoing discussions and training at staff, executive and board level. The OAIC does not require organisations to be “data breach proof”. Rather, the purpose of the scheme is to foster proactive remedial actions so that when a breach does occur, the likelihood of serious harm to the affected individuals is minimised. If the organisation takes remedial actions that prevent the likelihood of serious harm occurring for any individuals whose personal information is involved in the data breach, then the breach is not considered an eligible data breach. We encourage all our clients to implement the privacy management steps described in the previous section. They are laid out within our privacy management program which follows a methodical process and can be bolted onto your existing governance, risk management, systems governance, and internal control processes. We have been assisting our clients to assess existing privacy compliance processes, including designing privacy management programs. Our Privacy Management Program helps you to see the “big picture” without getting held up in unnecessary details. Please contact us and see how we can assist your organisation’s risk assessments, regulatory compliance and reporting mechanisms. Remember, you need to be able to demonstrate to the Commissioner that the steps listed above have been considered and/or performed.